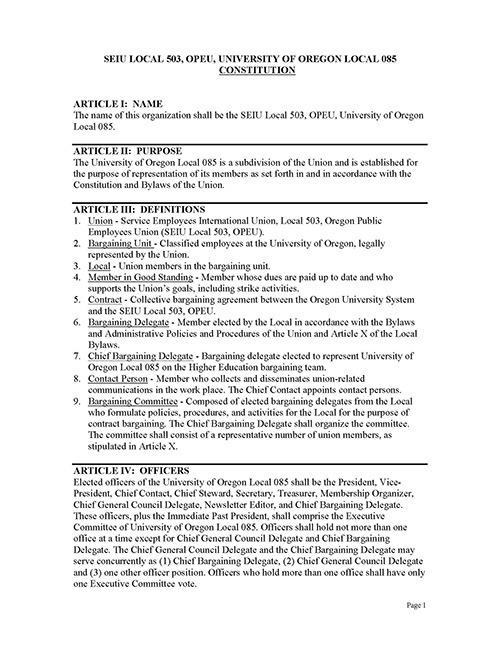 Below is the bylaws of SEIU Local 503, OPEU, University of Oregon Local 085. This document includes information on the duties of local positions, the procedures of local elections, and much more. The name of this organization shall be the SEIU Local 503, OPEU, University of Oregon Local 085. The University of Oregon Local 085 is a subdivision of the Union and is established for the purpose of representation of its members as set forth in and in accordance with the Constitution and Bylaws of the Union. Union – Service Employees International Union, Local 503, Oregon Public Employees Union (SEIU Local 503, OPEU). Bargaining Unit – Classified employees at the University of Oregon, legally represented by the Union. Local – Union members in the bargaining unit. Member in Good Standing – Member whose dues are paid up to date and who supports the Union’s goals, including strike activities. 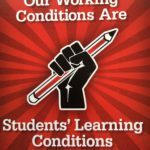 Contract – Collective bargaining agreement between the Oregon University System and the SEIU Local 503, OPEU. Bargaining Delegate – Member elected by the Local in accordance with the Bylaws and Administrative Policies and Procedures of the Union and Article X of the Local Bylaws. Chief Bargaining Delegate – Bargaining delegate elected to represent University of Oregon Local 085 on the Higher Education bargaining team. Contact Person – Member who collects and disseminates union-related communications in the work place. The Chief Contact appoints contact persons. Bargaining Committee – Composed of elected bargaining delegates from the Local who formulate policies, procedures, and activities for the Local for the purpose of contract bargaining. The Chief Bargaining Delegate shall organize the committee. The committee shall consist of a representative number of union members, as stipulated in Article X. Elected officers of the University of Oregon Local 085 shall be the President, Vice- President, Chief Contact, Chief Steward, Secretary, Treasurer, Membership Organizer, Chief General Council Delegate, Newsletter Editor, and Chief Bargaining Delegate. These officers, plus the Immediate Past President, shall comprise the Executive Committee of University of Oregon Local 085. Officers shall hold not more than one office at a time except for Chief General Council Delegate and Chief Bargaining Delegate. The Chief General Council Delegate and the Chief Bargaining Delegate may serve concurrently as (1) Chief Bargaining Delegate, (2) Chief General Council Delegate and (3) one other officer position. Officers who hold more than one office shall have only one Executive Committee vote. The Constitution and Bylaws of University of Oregon Local 085 may be amended at a local meeting by a two-thirds majority of members present. There must be a five-day advance notice to the membership that an amendment to the Constitution or Bylaws will be voted on. To represent the members of the bargaining unit. To enforce and to administer the contract. To develop and maintain a system of communication for bargaining and for generalinformation. To ratify the collective bargaining contract. To foster and protect the general goals of the union. Represent the interests of the members of the Local in the collective bargainingprocess. Meet between Local meetings to transact necessary business of the Local. Maintain and regularly distribute a calendar of meetings and events, and a list ofExecutive Committee members to the Executive Committee. Serve as a voting member of and preside over all meetings of the ExecutiveCommittee. Appoint members to University of Oregon and Local 085 committees, with approvalof the Executive Committee, except the President shall not appoint stewards orBargaining Committee members. Attend District meetings and report back to the Executive Committee. Build relationships with other unions and community groups. Attend all committee meetings where a member unless excused by committee chair ofsaid committee. Ensure all timelines outlined in the Bylaws and Local strategic plan are met. Serve as an automatic bargaining delegate for the University of Oregon. Serve as a non-voting member of the Executive Committee except in the event of atie. Serve on such committees as may be designated in these Bylaws or to which s/he isappointed by the President. There is no alternative or replacement for Immediate Past President. The Immediate Past President may hold another officer position. Serve as the tie-breaker in the case of a tie vote. In the absence of or upon request of the President, perform the duties of the President. Replace the President for the unexpired term in the event of the death, incapacity,resignation, or removal of the President. Assist the President in all his/her duties, including building relationships with otherunions and community groups. Be responsible for the oversight of all Union bulletin boards on campus. Sit on the SEIU Local 503, OPEU Higher Ed Council, and report back to theExecutive Committee and Chief Bargaining Delegate. Work closely with the Chief Contact and activists on campus, and attend all ContactAction Team meetings. Be responsible for logistics of all campus actions planned by the Contact ActionTeam and/or Chief Contact. Be responsible for conducting periodic informational meetings in individualdepartments or buildings. Serve as a voting member of the Executive Committee. Attend all committee meetings where a member unless excused by committee chair of said committee. Be responsible for the Contact Action Team, including recruiting, training, flyerdistribution and mobilization for actions. Maintain a database of all contacts and activists, and create and print various reportsnecessary for mobilization, such as lists of members by zone. Schedule and preside over all Contact Action Team meetings. Be responsible for the Contact Action Team to insure that the system works at alltimes. Plan and prepare, with the Vice-President, actions on campus. Preside over all meetings of the Grievance Committee. Be responsible for the local enforcement of the collective bargaining agreement. Schedule and chair all Steward meetings. Meet contractual obligations as set out in collective bargaining agreement or SEIULocal 503’s Constitution and Bylaws. Communicate key issues and management misconduct to the Executive Committeeand especially to the Chief Bargaining Delegate. Record minutes for all meetings of the Local and Executive Committee. Distribute minutes to the Executive Committee at least three (3) days prior to the nextmeeting. Be responsible for all correspondence and for scheduling meeting sites and forcatering at meetings as needed. Maintain the financial records of the Local. Be responsible for all requests and disbursement of funds on behalf of the Local,including the Local Strike Hardship Fund. Maintain up-to-date budgets and prepare and distribute written quarterly reports to theExecutive Committee, and report to the membership quarterly. Be responsible for the recruitment of new members and the retention of currentmembers. Assist the Chief Contact with development and maintenance of the Contact ActionTeam. Receive all agency new employee lists, all agency bargaining unit lists, and all Local085 membership lists and shall use these lists to recruit new members and correctdiscrepancies. Be responsible for the Union presentation at the New Employee Orientation. Send out a letter to all Fair Share employees annually, urging them to becomemembers. Schedule and chair meetings of the Membership Organizing Committee. Attend committee meetings where a member, unless excused by committee chair ofsaid committee. Train, discuss and organize the Delegates to General Council in preparation for nextGeneral Council. After General Council, Chief General Council Delegate shall convene meeting of allGeneral Council Delegates to organize a report back to Local. Report to Local due inOctober. Twenty (20) weeks prior to next General Council, Chief General Council Delegateshall convene meeting of all Delegates to General Council to organize soliciting members’ resolution suggestions. Chief General Council Delegate shall solicit help from SEIU Local 503 to put resolution into proper format and submit by deadline. Be responsible for insuring that the Newsletter reaches the membership in a timelymanner. Schedule and chair meetings of the Newsletter Committee. Attend committee meetings where a member unless excused by committee chair ofsaid committee. Solicit and accept input from the Executive Committee on bargaining issuesimportant to the Local membership. Represent Local 085 on the Higher Education Bargaining Team. Chair meetings with the Bargaining committee as frequently as needed during activebargaining. If issues arise during off-bargaining season, Chief Bargaining Delegate shall convene the Bargaining Committee to resolve issues. Report bargaining updates at Executive, CAT, and brown bag meetings as required. In the Chief Bargaining Delegate’s stead, an alternate may provide updates. Maintain regular communication with the Alternate Chief Bargaining Delegate regarding bargaining progress and issues. Attend Regional Bargaining Strategy meetings, as feasible. Be appointed by the Executive Committee. Assemble Local 085 memorabilia, including but not restricted to, minutes of themeetings, Newsletter, local newspaper articles, contracts, etc. Advise the Local and Officers on past practices, Local history and labor-relatedpolitics. Serve as a member of the Newsletter Committee. Historian may hold an Officer position. Maintain the electronic database for Local 085 of all bargaining unit employees. Assist the Vice-President, Membership Organizer and Chief Contact with theirrespective committees, including production of reports and labels for mailings. Provide labels for the Local Newsletter or other purposes, as needed, as directed bythe Newsletter Editor. Database Manager may hold an officer position. Officers are subject to removal from their positions if any member or officer makes a written, signed complaint to the Executive Committee, and if the complaint addresses issues of misconduct and/or failure to perform duties. The Executive Committee will then meet with the complainant and respondent to determine, by majority vote, if removal is appropriate. If removal occurs, the Executive Committee will, in writing, give the reasons for removal. An officer may resign by submitting a written resignation to an Officer, or by verbally informing at least two members of the Executive Committee. 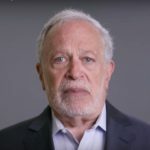 The Executive Committee will meet within two weeks of receiving the written or verbal resignation, and at that meeting, shall vote on whether or not to accept the resignation. A steward may resign by submitting a written or verbal resignation to the Chief Steward. Section 1. Leave of Absence. An officer or steward may request a leave of absence from official duties, as outlined in Articles I, II, III of Bylaws, for a period of time to be recommended by committee chair and approved by the Executive Committee. Officers who take a full leave of absence from their job at the University of Oregon shall also be required to take a leave of absence from their Local 085 Officer position, unless otherwise approved by the Executive Committee. The officer requesting leave shall recommend a temporary replacement for their position to the Executive Committee for approval one (1) month prior to the leave beginning, if possible, with the exception of the Immediate Past President (see Article 3, Section 2d). Section 2. Replacement of Officers. When a vacancy occurs, the Executive Committee may hold a special election or fill the unexpired term by appointment. An exception to this is a Presidential vacancy, in which case the Vice-President will assume the President’s office. If there is no Vice-President, the Executive Committee may hold a special election or fill the unexpired term of President by appointment. Section 3. Filling Steward Vacancies. In the event of a vacancy on the Stewards Council the Chief Steward shall appoint a replacement, with the approval of the Stewards Council and the Executive Committee. Section 1. Time Table. Elections shall be held in March of each even numbered year with installation of the officers to take place at the April Local meeting. a) The members of the Election Committee shall be announced at the January Local meeting. b) Nominations open at the January Local meeting, and remain open until the adjournment of the February Local meeting. Nominations will be accepted from the floor at the January and February Local meetings. c) Candidate statements will be provided to the membership at least ten (10) days prior to the March Local meeting. d) Ballots will be prepared and mailed to all Local members no later than March 5th. Ballots shall be returned to the Election Committee, or to SEIU Local 503, OPEU, by the last business day of March. e) Election results shall be reported to the Executive Committee and to all candidates within five (5) days after the ballots have been counted, but in any case no later than two days prior to the April Local meeting. Receive all nominations for elected positions, and verify qualifications of each nominee. Provide a report of nominations at the February Local meeting. Solicit and distribute candidate statements. Prepare and mail ballots to the membership, with the assistance of SEIU Local 503 staff as applicable. Tally ballots and announce election results. No candidate for office shall be permitted to tally ballots. Section 4. Term of Office. The term of each officer position shall be two (2) years. shall accept one officer position of their choice and decline the remainder, unless the member is allowed to hold more than one position under the Local 085 Constitution. Filling of the declined position(s) will be made by the alternates of the declined position(s), in the order of the number of votes received. If no alternates exist, or all alternates decline, then Article VII, Section 2-Replacement of Officers, is invoked. Any member of the Local may write resolutions to the General Council. Resolutions shall be forwarded to the President for presentation to the Executive Committee. The Executive Committee shall, by majority vote, decide to endorse or not to endorse the resolution. Resolutions not endorsed by the Executive Committee shall be returned to the writer with a written explanation for the Executive Committee’s decision, informing the member of the right to resubmit the resolution signed by the required number of members per the Union’s Bylaws and Administrative Policies and Procedures, at which time it will be automatically endorsed by the Executive Committee. The membership will have a chance to review and discuss all available resolutions at the last regular Local meeting before General Council. Section 1. Delegates to the General Council. Delegates shall be elected in accordance with Article VIII of the Bylaws. The Chief General Council Delegate shall serve as an automatic delegate, with the remaining number of delegates allocated to the Local by the Union’s Bylaws and Administrative Policies and Procedures to be elected at large. Delegates shall meet and elect an alternate Chief General Council Delegate. Represent the membership at General Council and any emergency session of GeneralCouncil. Report to the membership at meetings and in the newsletter on proceedings of theGeneral Council. Bargaining delegates shall be elected in accordance with Article VIII of the Bylaws. The Chief Bargaining Delegate and the Local President shall serve as automatic delegates, with the remaining number of delegates allocated to the Local by the Union’s Bylaws and Administrative Policies and Procedures to be elected at large by the general membership during officer elections. Except for a vacancy in the Chief Bargaining Delegate position, which shall be filled by the Alternate Chief Bargaining Delegate, vacancies will be filled by the alternates from the general election in the order of the number of votes received. If no alternates exist, the Chief Bargaining Delegate shall appoint a replacement, with the ratification of the Executive Committee. Attend bargaining conferences as voting representatives of Local 085. Attend Bargaining Delegate meetings during bargaining as convened by the ChiefBargaining Delegate, and provide input and support to the Chief Bargaining Delegate. Meet and elect an Alternate Chief Bargaining Delegate, who shall be ratified by theExecutive Committee. Assist the Chief Bargaining Delegate in his/her duties. Replace the Chief Bargaining Delegate at the bargaining table whenever necessary. Serve as the secondary contact for reporting bargaining updates to Executive, CATand brown bag meetings. Section 3. Removal of Bargaining Delegates. The removal of Bargaining Delegates shall be by the same procedure and for the same reasons as defined in Article V.
Section 1. Selection. Union Stewards shall be elected in accordance with Article VIII of the Bylaws. The number of Union Stewards shall be determined by the Local’s bargaining contract. The term of office shall be two years. Represent employees in the grievance procedure. Enforce the collective bargaining agreement. Take legitimate suggestions and complaints to the proper office or Unionrepresentative for action. New stewards are required to attend SEIU grievance training or LERC stewardtraining within six (6) months of accepting office. Chief Steward can appeal deadlineto the Executive Committee. Must attend all Stewards Council meetings unless excused by chair. Be elected from the Strike Hardship Fund and Members Needs Committee by the Strike Hardship Fund and Member Needs Committee and ratified by the Executive Committee. Schedule and chair meetings of the Strike Hardship Fund and Member Needs Committee. Work closely with the Local 085 Treasurer to keep an accurate accounting of the strike hardship fund and to ensure the committee follows any laws or regulations required. Perform all duties as a member of the Strike Hardship Fund and Member Needs Committee. Attend Executive Committee meetings upon request of the Executive Committee. Section 2. Selection. Ten (10) members of this committee shall be elected by the general membership during regular officer elections. The purpose of this committee is to fundraise for the Local 085 hardship account, provide financial support to members during strike activity, and coordinate with community organizations for member’s needs. Strike Hardship Fund: Local 085’s Strike Hardship Fund was set up with the express purpose of providing faster, less extensive aid to members who have a financial hardship during a strike. Members must have honored strike activity to be eligible for strike hardship funds. Local 085’s Strike Hardship Fund is not meant for disbursement during non-strike times. Member Needs: The committee shall coordinate with community organizations regarding available resources for Local 085 members. Members may self refer or officers/committee members may refer a member in need to the appropriate organization. Raise funds for the locally controlled strike hardship fund. Inform membership of statewide and local hardship fund(s) application process, rules and general information regarding the various funds. Facilitate the hardship application(s) from members for money from various hardship funds available under SEIU Local 503, OPEU and within Local 085. Make recommendations to the Executive Committee for disbursement of strike hardship funds. Inform membership of community organizations available for additional resources. Section 1. Local 085 shall hold general membership meetings at least once each quarter. A quorum for the meetings shall be ten members, including at least one officer. Section 2. Meetings will be held either noon or evening, and place to be determined by the Executive Committee. Additional meetings may be called for any date at the request of the Executive Committee. Local members shall be notified at least five calendar days before the date of the meeting. Section 3. Ten or more members of the University of Oregon Local 085 may call a general membership meeting for any date by written request to the Executive Committee at least five calendar days prior to the date of the meeting. Grievance Committee – The Grievance Committee shall be comprised of members inaccordance with the contract. The Committee shall consist of the Chief Steward and two members elected of and by the Union Stewards’ Council. The Grievance Committee shall serve as the executive arm of the Union Stewards’ Council and shall work with the Chief Steward to coordinate Union Steward functions. Union Stewards Council – The Union Stewards Council is a committee of all Union Stewards that shall meet regularly at the call of the Chief Steward. The Chief Steward shall preside over all meetings of the Union Stewards’ Council. Newsletter Committee – Assist Editor with production of newsletter, including proofreading and disbursement. Strike Hardship Fund and Member Needs Committee – Fundraise for the Local 085 hardship account, provide financial support to members during strike activity, and coordinate with community organizations for members’ needs. Membership Organizing Committee – Assists the Membership Organizer and Executive Committee with projects to educate, motivate, retain and gain members. Section 2. The Chairs of the above committees shall give periodic reports regarding their committee at Local 085 meetings either upon request of the Executive Committee or from any member. It is highly recommended that committee decisions that impact the bargaining unit be reviewed for input by the Executive Committee. All monies of Local 085 will be kept in a Central Ledger account and the Local’s Treasurer will make disbursements. The Executive Committee can authorize expenditures less than $1,000. All other expenditures will be authorized by the membership.